The Wetaskiwin Memorial Centre was a full-house venue on June 6th, 2014 as guest gathered for a unique trip into history. The evening titled ‘Remembering D-Day, Celebrating the Home Front’ treated guests to a musical performance in remembrance of the 70th anniversary of D-day and WWII. 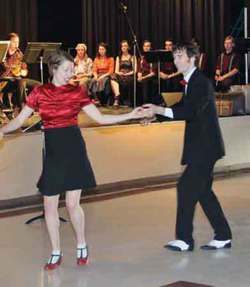 The program was comprised of 3 Acts and featured eighteen songs and dances from the wartime era such as In the Mood, Moonlight Serenade, All Aboard, Don’t Get Around Much Anymore and Nightinggale in Berkeley Square. The musical performances were strategically accompanied by a video show featuring photos and interviews that explained what life, and lifestyles were like during the War; some of the challenges and some of the achievements and rewards. The grand finale included the entire cast with Deanna Didriksen on vocals, the Club Ed Big Band and the Jazz Cats Singers performing Vera Lynn Medley.